Millard Fuller Legacy Build 2010 -"Truly we have met God this week." Today was the final day of the Millard Fuller Legacy Build week and it was amazing! The houses were dedicated and we had a wonderful closing supper and ceremony. It was time to say goodbye to our friends, but we knew it was only a temporary time away from each other, as plans are already being made for a spring build in Louisville in connection with the annual covenant partner conference. Webster Parish will be the host site for MFLB 2011 the first week of October. All week, I have been visiting with the volunteers asking them what they thought was the most significant faith statement made by this build. 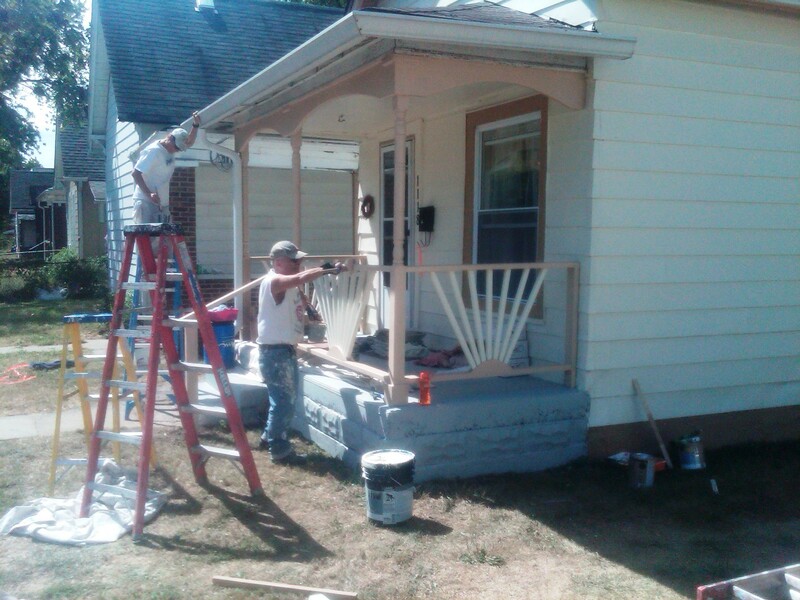 I visited a Greater Blessing project where my friend Tamara Danel was working all week, replacing the deteriorating and leaking exterior of a house with a beautifully painted green cement board siding. Tamara serves on the board of directors of The Fuller Center for Housing and is the driving force behind the Northshore Fuller Center for Housing in Louisiana. Tamara told me just moments before I walked up on the porch, Nichole Nordeman’s new song "Legacy" was playing on the radio. She said it was an appropriate song for our Legacy Build. She said it motivated her to think about what we were leaving behind observing "what we doing for the families is a gift to Jesus Christ." I spent a good part of the day with Jen and Lee Bigelow. This couple has been my host family all week, even providing me with a vehicle to drive to and from the job site so the Fuller Center wouldn’t have to pay for a hotel or a rental car while I’m here. Jen is a Family and OB doctor. 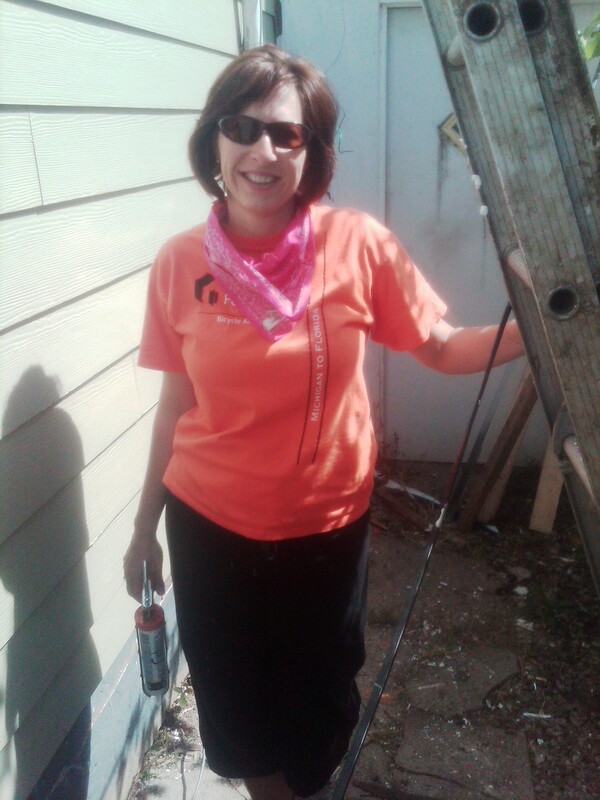 We became friends in 1994 when she served as our Collegiate Challenge coordinator at Almost Heaven Habitat. Jen and Lee came down to the build site to volunteer on their day off, even though Jen only got three hours of sleep the night before because she was delivering a baby. My question about faith made her think about the "hands on service," but she wondered aloud if some volunteers were here because of faith or because they view the build simply as a humanitarian effort to share their skills. Perhaps they came because it was an excuse to have some fun. She admitted that at some level her early involvement in the 1990’s was probably motivated by a desire to have fun. But now, her faith statement begins with the families and our efforts to "reach them for the Lord." Jen says that it is still fun to volunteer, but she has come to appreciate the importance of Habitat and the Fuller Center being grounded in Christian principles. "We shouldn’t fear turning people off by our faith. It is okay to say that this movement is much bigger than ourselves." I let Jen get back to work and I wandered through the site watching the volunteers put the finishing touches on their houses just before the dedications. It was an amazing week! I wondered how to sum up the experience and the incredible faith reflections I heard from the volunteers. I walked past some volunteers from a coalition of churches completing a Greater Blessing renovation for 87 year-old Cleda Lovel. Cleda’s little shotgun house was falling down around herand it was making her sick. The drug dealers were making her fearful for her life. She left her home for a long period. 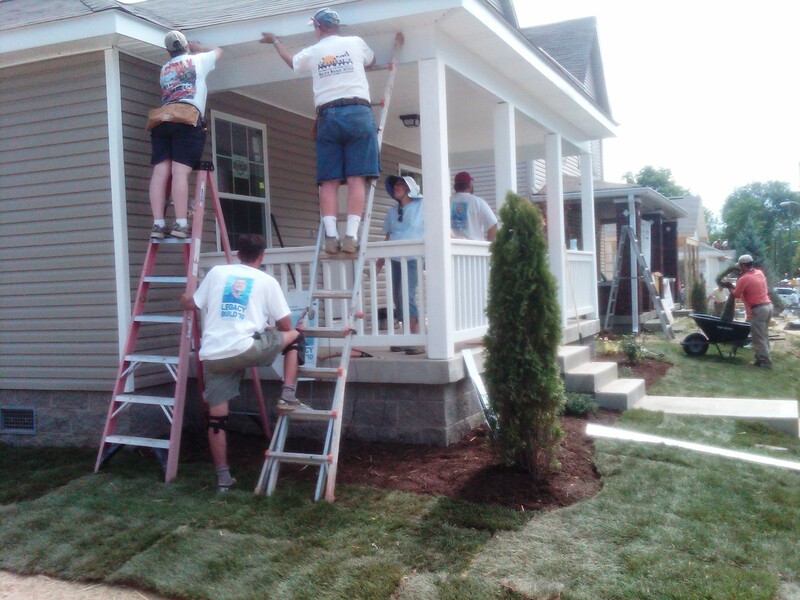 But when SEND and The Fuller Center and Greater Indianapolis Habitat for Humanity collaborated to bring renewal to the neighborhood, she decided she wanted to return home. Now with new windows, a functioning accessible bathroom, good insulation and some loving care on the outside she has returned to live out the rest of her life at home. I couldn’t find the words to express the feelings I had seeing the beauty and the compassion that the volunteers brought to Claudia. I thought, "There’s no way to sum this up." But at the final celebration tonight I listened to the homeowners thanking the volunteers. I began to tear up as one mother expressed the words for me, "Truly we have met God this week." Thanks for reading and please feel free to add your own comments and observations here or on Facebook or directly to my by email. Safe traveling until we meet again.